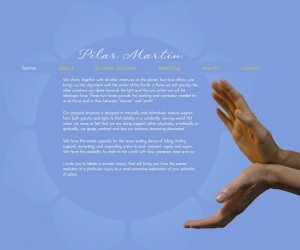 Pilar Martin is a Certified Advanced Rolfer, nurse-midwife and somatic practitioner. For those who are not familiar, Rolfing is “holistic system of soft tissue manipulation and movement education that organize(s) the whole body in gravity”. Pilar’s site is a great example of how our designs come about organically in collaboration with our clients. Much of the time the final design is driven by discovery of where our client’s passion lies. With Pilar, the starting point was a very specific color. And it was important the design wasn’t bounded by the typical boxes that constrain most websites. The hands, a very important element to her work, were her own. The real trick of balancing all of these elements was bringing warmth to a very cool hue of blue.